and Organized Militia of the United States. 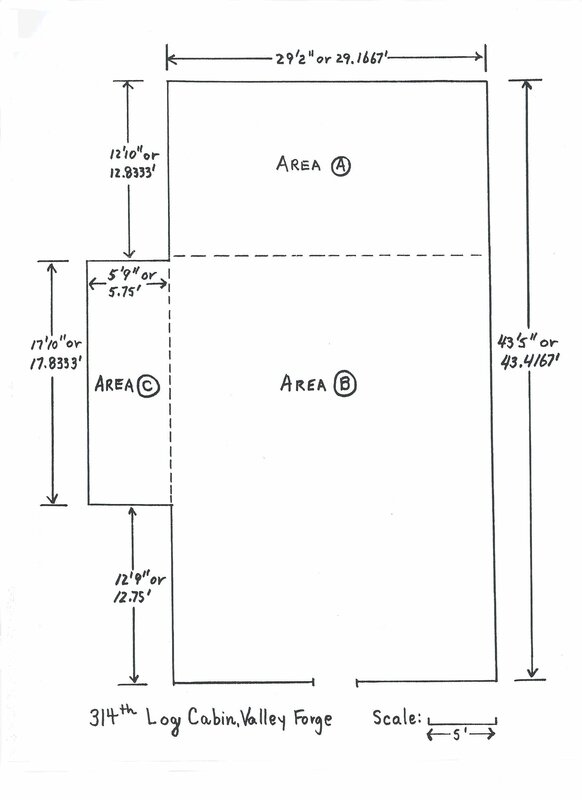 order to be able to calculate the lengths of the sides AD and BD. value of the angle DBA. telescope at B will read directly the range of the object D from A.
could then be read directly from the angle scale on the telescope at B.
finders in which the field is divided into three parts. piece appears to move laterally across the field. to the telescope at A in the improvised range-finder just described. means of the reflecting prism B.
the telescope is moved optically by means of the reflecting prism P.
This prism is sometimes called the angle-measuring prism or wedge. range AD (fig. 1) on the range drum attached to the reflecting prism. prism P, the reflecting angle of which is very small. range-finder even if its position were varied by small amounts. reflectors A,, and B on Plate I.
tions by gearing connected to the range drum. 80 cm. 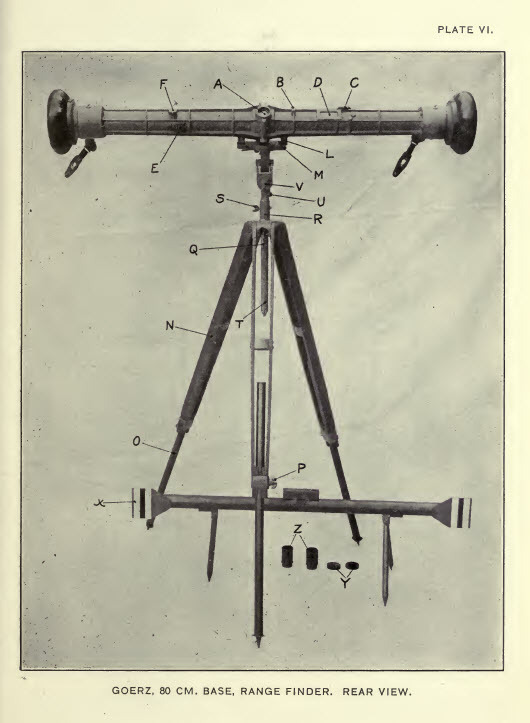 base range-finder are shown on Plate IV. the lower field was reflected in the sky. optics, however, are more complex. The best denned part of an object should be selected to range on. called personal errors which diminish as their experience increases. range by taking the mean of several consecutive readings. methods of making the adjustments for height and distance. E. Protective cap for height adjustment'screw. F. Protective cap for range adjustment'screw. P. Locking screws for O.
Q. Locking lever for N.
S. Locking screw for spur. U. Locking screw for pivot. V. Locking screw for tilting joint. Actual field of view in degrees, 4. Shortest distance measurable, 400 yards. position as in the instrument. positions by supporting it with the hands. height of the observer's eyes. toward the observer, and seat the instrument firmly on the tripod. finder so that its longitudinal axis is horizontal and relock screw V.
Dismounting is accomplished in the reverse order. replaced to guard against unauthorized or accidental shifting. screw (C) and the reading of the range scale noted. provided to protect the eyes of the observer from a glare of light. it is inverted (fig. 3, Plate II) . so that the proper points will touch the dividing line (fig. 4, Plate II) . above. The image first appears as illustrated in figure 7, Plate II. proper, the tripod, the accessories, and the carrying cases (Plate IX). C. Revolving collar (covering rollers). D'. Range-adjustment roller (not seen). F. Window for illuminating range scale. G. Window for illuminating adjusting marks. H. "Air" and " field " adjustment. I. Locking screw for pivot. V.- Locking lever for leveling device. O. 2 color screens, 1 brush, and 1 piece of chamois. W. Range-finder, case with tripod. Magnifying power, about eleven times. parts composing the spur are spread and used as a short tripod. holds the instrument to the required height. be adjusted in the casing to suit the height of the observer's -eyes. adjustment roller should always be covered when not in use. the revolving collar (C), Plate VII, marked " Stadia adjustment"
justment should be made by setting the scale at the average setting. ment levers turned to a horizontal position. then be memorized for future use. in azimuth is accomplished by loosening the locking screw (I). the narrow band in the center is inverted and the upper field is erect. finder in a vertical position. finder proper, the tripods the accessories, and the carrying cases. C Height-adjusting roller (under slide). G Range scale (under slide). I Cover for ginible joint screw. M Amber and smoked glass lever. U - -Tripod clamp knob. V -Tripod casing and head. 1 brush and 1 piece of chamois. this case for the accessories. Shortest distance measurable 400 yards. position by supporting it with the hands. to guard against unauthorized or accidental shifting. the 70-cm. Bausch & Lomb range-finder, page 18.
adjustment for reading correct ranges. should then be ^memorized for future use. azimuth clamp (T), and turn the range-finder toward the target. dence, therefore, must always be made on the lower dividing line. PL II.) The range is then read on the range scale. Officer or by an arsenal especially equipped for instrument work. the mechanical and optical parts. range-finder should be wiped off with a cloth. pose. Dry dust is removed with the brush. paste must not be used on any part of the instrument. etc., not incident to its use or cleaning, is strictly forbidden. GOERZ, 80 CM. BASE, RANGE FINDER. FRONT VIEW. GOERZ, 80 CM. BASE, RANGE FINDER. REAR VIEW. fc BAUSCH & LOMB, 70 CM. BASE, RANGE FINDER. REAR VIEW. BAUSCH & LOMB, 80 CM. 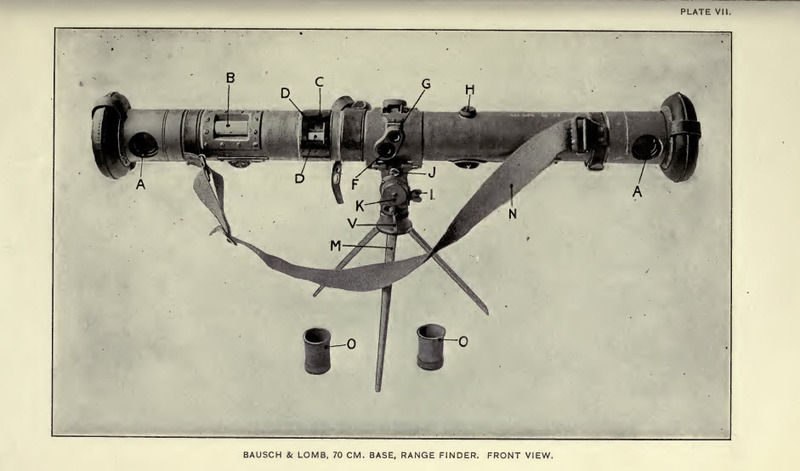 BASE, RANGE FINDER. FRONT VIEW. BAUSCH & LOME, 80 CM. 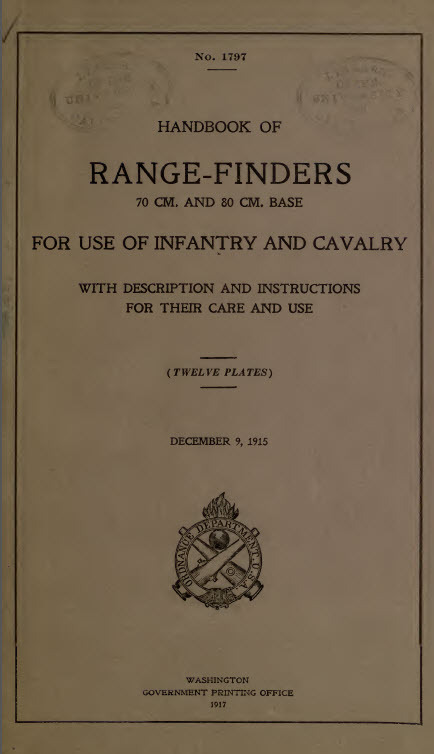 BASE, RANGE FINDER. REAR VIEW. GOERZ, 80 CM. BASE, RANGE-FINDER CARRYING CASE. BAUSCH & LOMB, 80 CM. BASE, RANGE FINDER, WITH SHORT TRIPOD.